Vinyl Taco is lighting up downtown in a vintage gathering space and creating the most fun anywhere. 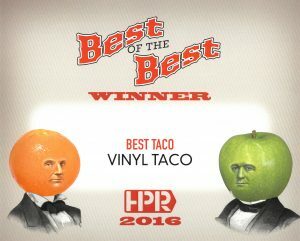 Vinyl Taco has become successful thanks to their perfect blending of food and drink. Megan Ward shares one of their newest beverages. It’s no secret that we all crave the perfect summer beverage. Not only that, but why would we strive for just a great drink? Why not great food too? Vinyl Taco in Downtown Fargo has become wildly successful thanks to their perfect blending of food and drink. Have a specific taco you love? Chances are Vinyl Taco has a drink to complement it. We had one of their great mixologists, Megan Ward, introduce us to one of their newest beverages. Now that it’s summer and patio season, are the margaritas flying out of the bar here at Vinyl Taco? Oh, absolutely. Especially the jumbo margs, you got your groups of friends coming out and they want to share one (or have one for themselves). I would say our classic lime would be the most popular, it’s like a normal margarita that people seem to like the most. However, I think the strawberry is really good too. So, how does one make an avocado margarita? Well, it’s actually a lot like our Cadillac margarita that we already have on the menu. The only difference with this one is that it does not have Triple Sec in it. Rather than putting that in there, we put in avocado salsa. It still has lime juice, the tequila and some syrup, but the avocado replaces the Triple Sec. What kind of flavor does the avocado bring to a margarita? When you’re drinking it, what does it remind you of? And do you think people are turned off when they hear avocado in a margarita? It’s just like guacamole, I think. I don’t think people get turned off by it, I actually think people will love to come in and have this drink. It’s one of those things where if you try it once, you may never look back because it’s that good. If you like guacamole, salsa and really good Mexican food this is going to be perfect for you. Which taco on the menu would you pair with this drink? I would have to say the fish taco because you already have the avocado salsa on it. Maybe the cilantro lime chicken taco too. The drink kind of cools down the jalapeño ranch that’s on that one. How do you relate to this drink on a personal level? It’s something new, mixed with something traditional. I really like to get out and try new things, that’s just the way I am. I do things that are outside of the box, but I don’t veer too far away from the norm. This is still a margarita, it’s just a little different is all. The record-shop-themed interior of Vinyl Taco isn’t exactly what one expects in the middle of Grand Forks, North Dakota. But this little slice of modern hip in the northern prairies serves up tacos that could stand up to anything from a bigger city. The menu is long on Mexican street fare, and if you like the traditional stuff the chili chipotle barbacoa is the way to go. 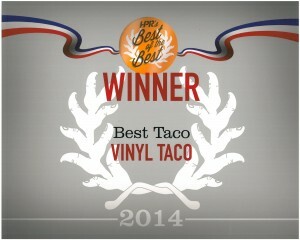 But Vinyl’s made its mark with more-creative tacos. Try the smoked sweet and sour pork belly with tobacco onions, or the crispy chicken and mango with fresh spinach, cheese, and a sweet onion vinaigrette. 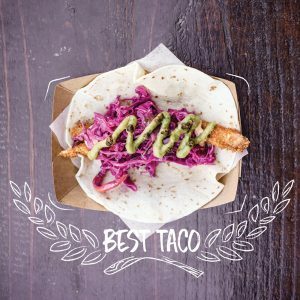 This taco was the runner-up to another one of Vinyl Taco’s creations in last year’s Flavor Awards, so it comes as no surprise to see it at the top this year. In this tortilla, crispy crusted chicken is accompanied by fresh spinach, shredded cheese, fresh diced mango and a house-made sweet onion vinaigrette for a sweet and savory flavor combo. Vegetarian dishes vary far and wide across every restaurant in town, but the public clearly fancies tacos this time around. This veggie taco is loaded with grilled queso fresco, creamed corn, pico, black beans, serrano-avocado salsa and blanco crema. Even if you’re not a vegetarian, this taco will do you no wrong. 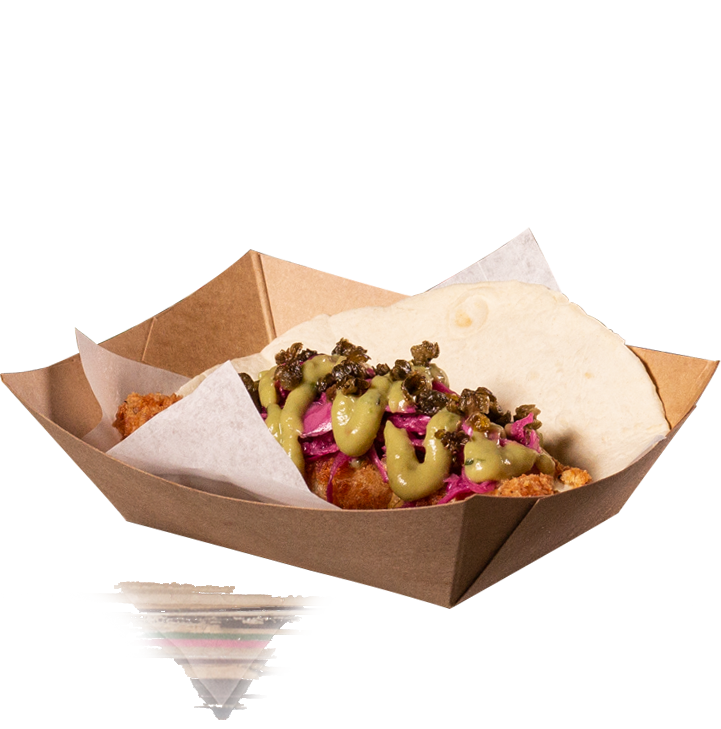 Crispy whitefish sits on a warm tortilla and is layered with red slaw, Sriracha tartar, fried capers and a tasty serrano- avocado salsa for a flavor palate that any type of taco lover can’t help but seriously enjoy. Ben Becker went from fine wines at Doolittle’s Woodfire Grill on the southside, to Spicy Chihuahuas at Vinyl Taco downtown, and that’s just fine with him. 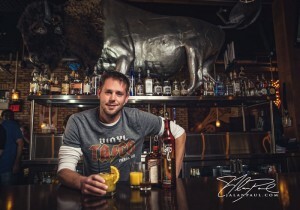 Becker, who has been slinging drinks for more than five years, came to Vinyl Taco in February and is enjoying the change of scenery. This Mexican bar/restaurant, which serves authentic street food, such as tacos served in cardboard trays, is also known for its drinks menu. 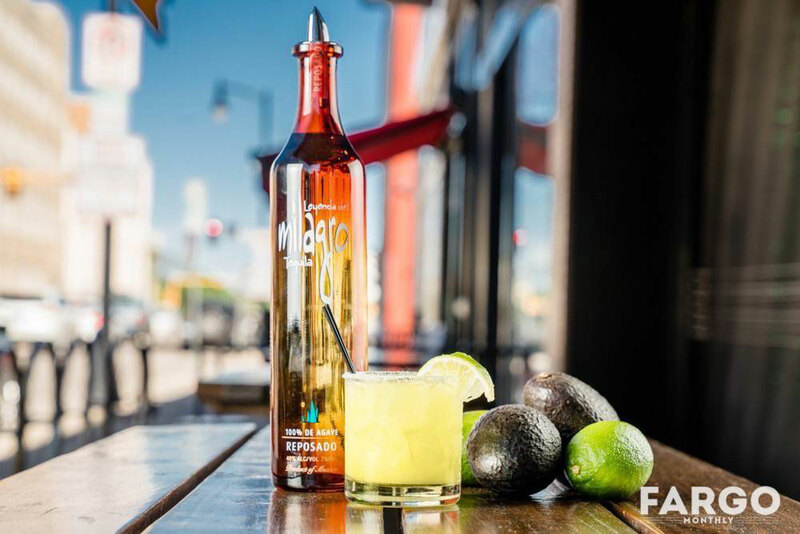 Becker recommends Vinyl Taco’s most popular drink, the Cadillac Margarita, which includes Milagro Tequila Silver, Cointreau, simple syrup and fresh lime juice with a salted rim and a lime wedge. Vinyl Taco’s drink menu is seasonal, giving the bar/ restaurant some cocktail variety and capitalizes on new trends as fall rolls into the area. Becker believes that The Clove Shack, is that perfect drink. The clove flavor stands out but isn’t in your face and it’s light enough to drink a couple, he said. It’s all about the sights, sounds and tastes at Vinyl Taco. Seemingly always packed for lunch, the eatery is an ideal workday getaway, with bands like Fleetwood Mac and David Bowie playing on the turntables behind the bar. The front windows open like garage doors for great street watching, there’s the antique Coca-Cola coolerturned- couch, original artwork and the massive bison amid liquor bottles. Besides the tacos, Vinyl Taco is known for its drinks and is open late. Go for the music as well as the tacos, Vinyl Taco plays records on turntables behind the bar in this authentically Mexican joint. Serving street food both of American and Mexican origins, order a bowl of chips and guacamole to start before deciding between a choice of enchiladas, chimichangas, tacos and sides. 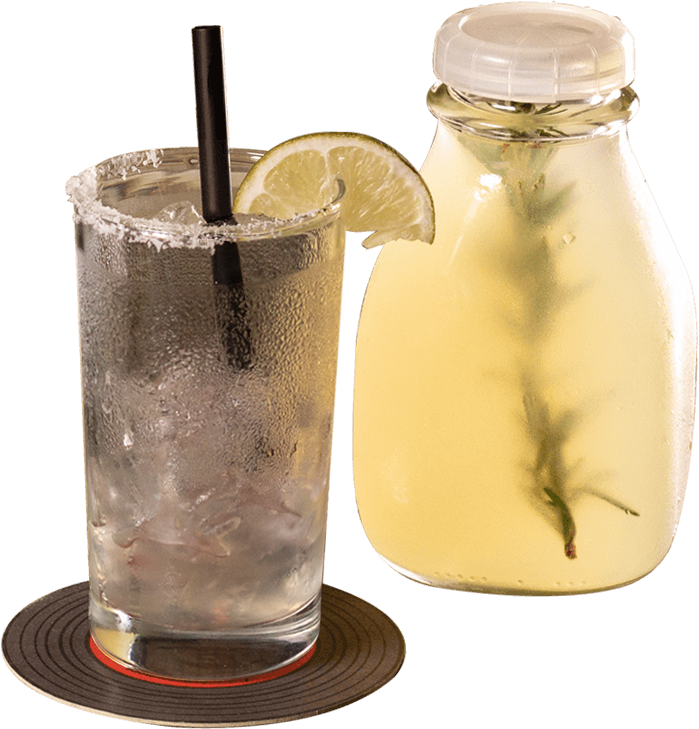 A great selection of margaritas, tequila, moonshine and bourbon are available to complement the food, and the agua de hibiscus is a deliciously fresh choice of beverage for those looking for something non-alcoholic. 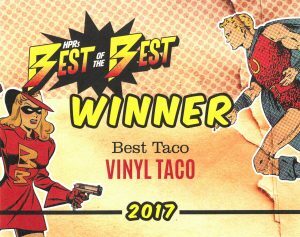 Even though Vinyl Taco is fairly new to Fargo, its popularity and rave reviews are growing exponentially. The recently extended menu offers more “best taco” options for guests, along with a stellar drink menu. Great food and a great atmosphere (all the music is actual vinyl played in the back) makes Vinyl Taco a hot spot for a well-priced and enjoyable meal. Since opening in the fall, Vinyl Taco has been helping reshape the appreciation of tequila from a spring break shot to something sipped and thoughtfully considered. 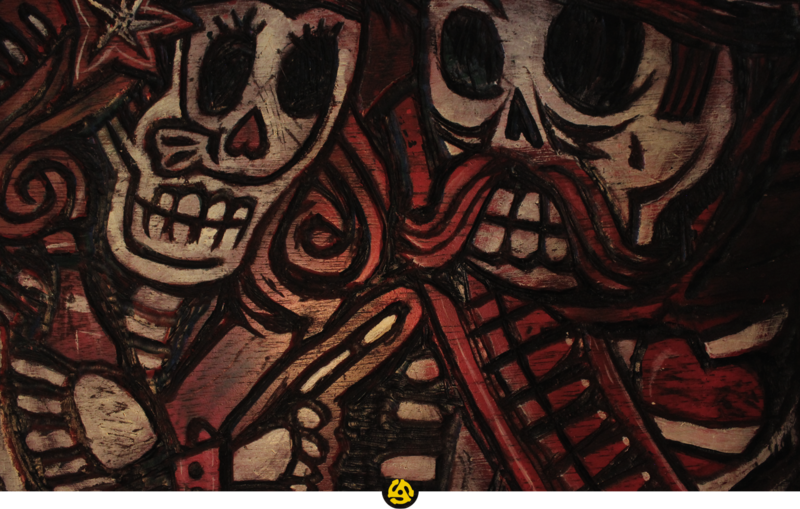 “Tequila shouldn’t be looked down on because of what Jose Cuervo did to the market. It should be appreciated,” McKenzie said. “If you sip it, it’s a fantastic liquor.” When customers order a tequila, Vinyl Taco staffers don’t serve it with salt and limes, what McKenzie refers to as “training wheels,” unless requested. “If they follow the recommendation, they’ll be pleasantly surprised and not overpowered,” he says. “Let’s get back to its heritage. The salt and lime, that’s Americanized. Traditionally in Mexico, it’s meant to be sipped neat,” says Cassie Kouba, who works at Republic National Distributing Company, Fargo, doing training and promotions on different liquors. “You can sip tequila like you can sip a scotch. There are days to enjoy a good tequila on the rocks,” she adds. Kouba and McKenzie both agree that the first thing you should know about tequila is just what kind of tequila you’re drinking. McKenzie says a big obstacle with the drink is that people associate it bad hangovers, but don’t take into consideration the quantity they were drinking – usually shots – and the quality of what they were drinking. 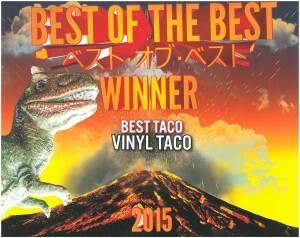 Take Vinyl Taco for a spin if you enjoy music and Mexican food. If you’re into music and tacos, you’ll find platters of both at Vinyl Taco. The new downtown Fargo eatery is tentatively set to open sometime between Oct. 16 and Oct. 21. It will offer a full-service bar and restaurant, and the food and drinks will have a distinctly south-of-the-border flavor. The “vinyl” in Vinyl Taco refers to the bar’s analog music collection that bartenders will play on turntables kept behind the bar. Owner Warren Ackley said employees will play requests, but for the most part they will spin entire albums at a time, not singles. The setup is in keeping with Vinyl Taco’s mission statement – “Tuned in music, turned on tacos” – said Ackley, who developed the restaurant with business partners Randy Thorson and Lance Thorson. 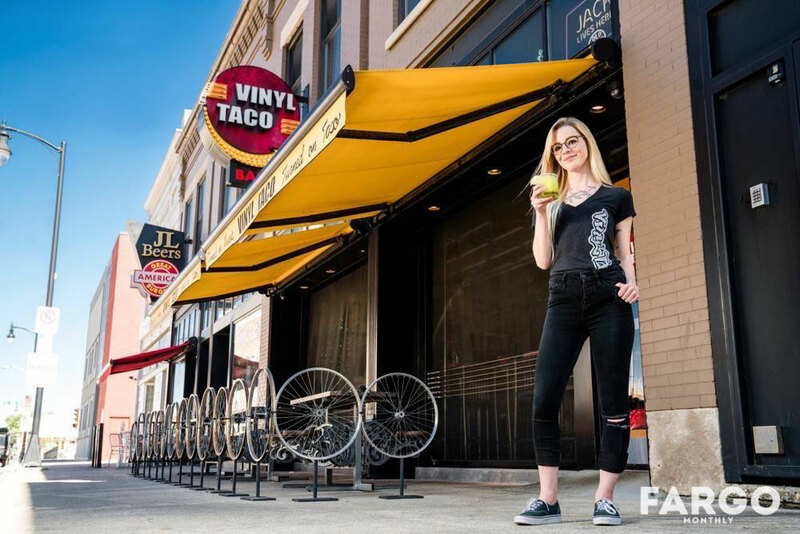 Vinyl Taco will have two sides: One is the bar and restaurant, which seats about 80 and is aimed at the 21-and-older crowd; the other is a standing area where people, including those younger than 21, can order tacos and Mexican soft drinks to go. From the standing area, customers can look through a window and view the gleaming stainless steel of the kitchen, where fresh corn tortillas will be made in-house. Ackley described Vinyl Taco’s cuisine as more street food than restaurant fare. The building itself was modified to invite the outdoors inside. The front windows are actually large doors that can be raised to reveal large screen doors. While showing how the doors worked, Ackley said they expect the screen doors will be used for up to six months out of the year. He also showed off the restaurant floor, which is comprised of 200-year-old floorboards taken from a barn in Gettysburg, Pa.The brick walls and tile ceiling are original to the 1910 structure, according to Ackley, who said the business has pretty much everything it needs to start up except for one critical ingredient – workers. He said Vinyl Taco is still looking to hire bartenders, cooks and servers. Anyone interested is encouraged to show up at the restaurant, or apply via the Vinyl Taco Facebook page.